We gratefully acknowledge this map (one of a set of maps) provided by Agnes Walker, saved by her father-in-law Raymond Walker, 315th Infantry A.E.F. and the Relative Position and Designation of the Divisions in Line of the American Army During the Meuse-Argonne Offensive. 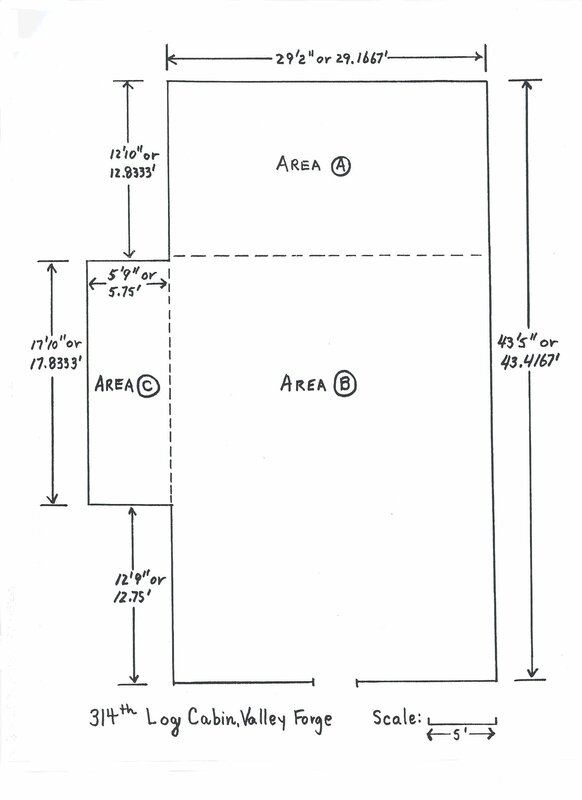 The map above is displayed at 150 dpi (dots per inch), Click here to see the 23 Megabyte map at 300 dpi. It is thought the lines shown are as near accurate as it will everbe possible to obtain. The following procedure was used in their compilation. 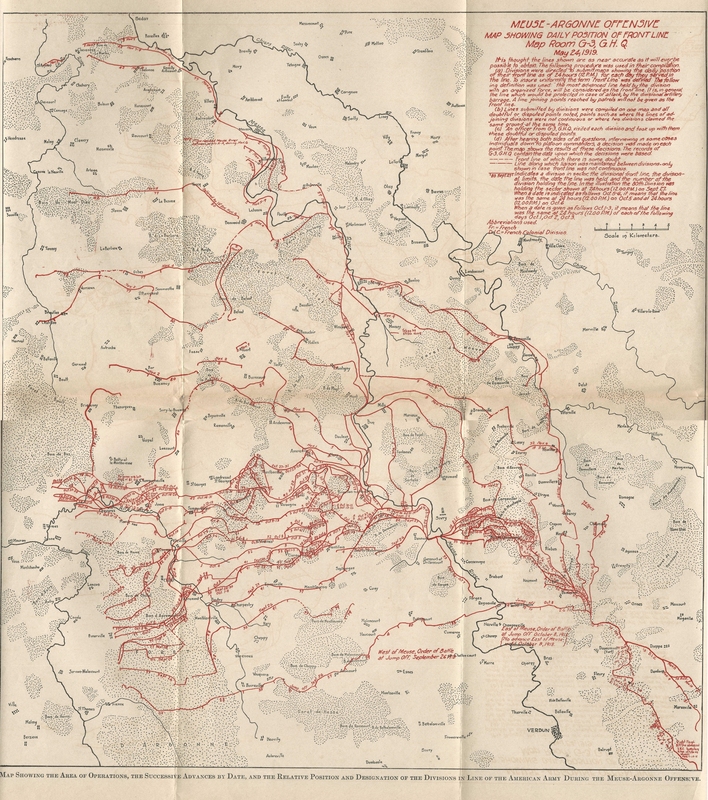 (a) Divisions were directed to submit maps showing the daily position of their front line as of 24 hours (12 P.M.) for each day they served in the line. To insure uniformity the term "front line" was defined. The following definition was used: "the most advanced line held by the division with an organized force, will be considered as the front line. It is, in general, the line which would be protected in case of attack, by the divisional artillery barrage. A line joining points reached by patrol will not be given as the front line. (b) Lines submitted by divisions were compiled on one map and all doubtful or disputed points noted, points such as where the lines of adjoining divisions were not continuous or where two divisions claimed the same ground at the same time. (c) An officer from G-3, G.H.Q. visited each division and took up with them these doubtful or disputed points. (d) After hearing both sides of all questions, interviewing in some cases individuals down to platoon commanders, a decision was made on each point. The map shows the results of these decisions. The records of G-3, G.H.Q. contain the data uponi which the decisions were based. -- . -- . -- Line along which liason was maintained between divisions. Only shown in case front line was not continuous. __________ '80 Sept 27' Indicates a division in sector, the divisional front line, the divisional lmites, the date the line was held, and the number of the division holding the line. In the illustration the 80th Division was holding the sector shown at 24 hours (12.00 P.M.) on Sept. 27. When a date is indicated as follows Oct 5-6, it means that the line was the same at 24 hours (12.00 P.M.)on Oct. 5 and at 24 hours (12.00 P.M.) on Oct. 6. When a date is given as follows 1-3, it means that the line was the same at 24 hours (12.00 P.M.) of each of the following dates: Oct. 1, Oct. 2, Oct. 3.